In video three of the 7-part video series on how to wire a switch: from rough-in to finishing, I cover the proper method for grounding connections. 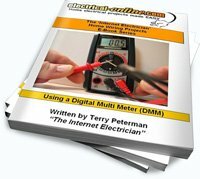 Proper grounding (earthing, bonding) methods are critical to ensuring the integrity of your electrical system. The grounding conductors are there for your protection, the proper functioning of the electrical system, and for the safety components like the circuit breakers, fuses, or over-current devices. In part three, I demonstrate the proper way to connect the ground wires, and answer the question of when you need to attach a ground wire to a device. The next video post in this 7-part series on how to wire a switch: from rough-in to finishing will cover the steps to splicing the neutral conductors. Click here to view. This entry was posted in How-To-Videos and tagged 2-gang box, device, DIY wiring, ground, ground wires, grounding, how to wire a switch, multi-gang, switch, switch box, wire, wire a switch, wiring. Bookmark the permalink.